The Fellowship was fortunate enough to obtain a copy of THE HIGH WAYS #1 from IDW Publishing. The story and art is by John Byrne, colors by Leonardo O’Grady, and letters by Tom B. Long. Eddie Wallace is the newest member of the Carol Ann, a space freighter commanded by Jack Cagney and Marlyn Jones. They receive an order that takes them to Europa to pick up biologic and geologic samples. However, there is a problem … they weren’t expected. The Carol Ann is forced to land due to low fuel and the crew tries to find out what is going on with the order that no one placed. So they have to stay there while enough fuel is generated for them to get back home, but what secrets is this station hiding? I am a longtime fan of John Byrne, but his more recent work can be hit or miss with me. This book has the potential to be pretty good mini series. There is enough here for me to pick up the next issue and see what is going on at the Europa station and who sent the pickup order. I like Bryne’s art, but wish he would let someone else ink his pencils (maybe Tom Palmer or his X-MEN partner Terry Austin?). 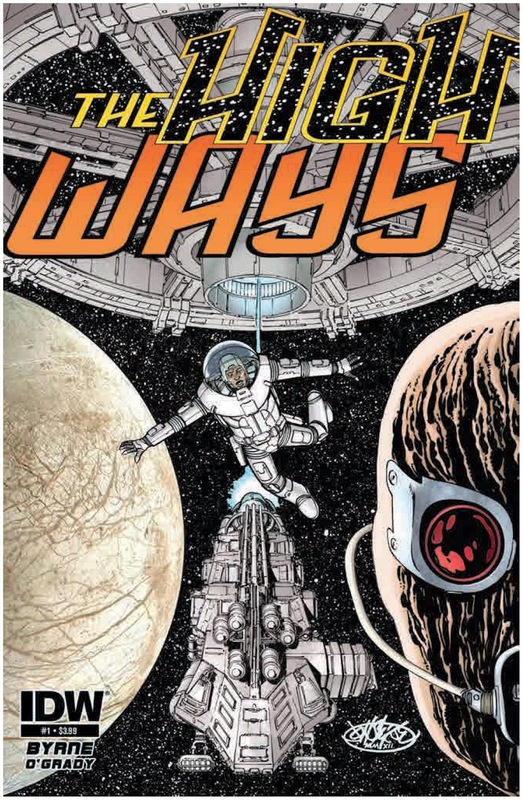 THE HIGH WAYS #1 is in stores now and available at www.idwpublishing.com.